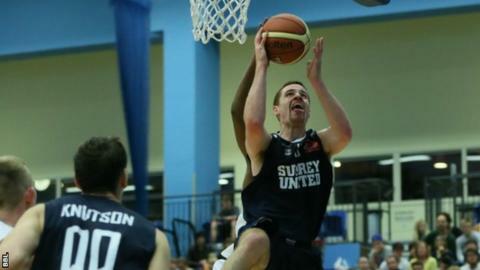 Surrey United guard Kirk Crecco scored 32 points to secure his side a 91-74 victory over Bristol Flyers for just their second win of the season. Crecco scored 11 of those points shortly after Flyers took a fourth-quarter lead in the BBL Championship. There were also wins for Newcastle, Leeds, Durham, Worcester and Cheshire. Meanwhile, Kieron Achara's buzzer-beater sent Glasgow Rocks into the BBL Cup semi-final with an 85-84 victory over Leicester Riders. United's Crecco said after his performance: "Our win against Bristol was great for us and will hopefully serve as a solid turning point going into the important stretch we have coming up at the end of this month and into December. "My team-mates did a tremendous job of finding me in advantageous positions and fortunately, the shots were falling." In the Cup, Rocks led by as many as 12 points in the fourth quarter, but trailed by two as Achara launched a hopeful shot with time expiring, and it connected via the backboard to send Rocks through to face Bristol in the final four. There was another tight finish in the BBL Championship on Friday as Chavis Holmes's tip-in gave Worcester Wolves a 78-76 success at Sheffield Sharks. Leeds Force grabbed their second league win as they upset Durham Wildcats 70-62 on Friday before Wildcats bounced back to shock title contenders London Lions 80-73 on Sunday. And Newcastle Eagles stretched their unbeaten league sequence to nine with an 88-82 defeat of Plymouth Raiders, to remain in top spot, while Cheshire Phoenix overpowered Manchester Giants 99-82 without new signing and world's tallest basketball player Paul Sturgess. Teresa Manigrasso shone once again in the WBBL Championship, helping Team Northumbria beat both Brixton Topcats and Sevenoaks Suns to climb to second as Westfield Health Sheffield Hatters and Cardiff Met Archers recorded wins too.